Teacher Resources: The Colonial Williamsburg Official Site offers helpful tools for American History and Government teachers. Under the Education heading, teachers can browse the site for lesson plans, video clips from the Electronic Field Trip series, browse for information about school group visits, check out special products and programs, and learn about upcoming events in Colonial Williamsburg. The Colonial Williamsburg Foundation serves to educate “that the future may learn from the past.” Colonial Williamsburg is a living history museum that depicts eighteenth century life through restored/reconstructed buildings and costumed interpreters; Colonial Williamsburg presents multiple perspectives from the time, including different races and social classes, to provide guests with a more in depth understanding of eighteenth century issues and events. 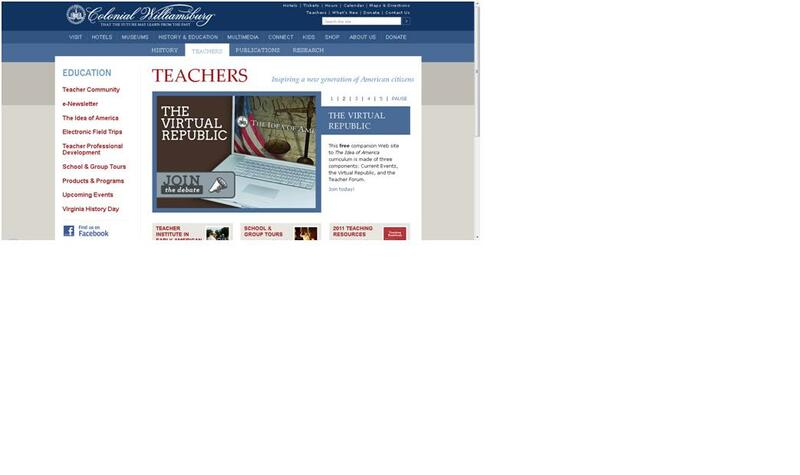 The Foundation’s website helps to bring history alive, and serves as a phenomenal resource for teachers across America. 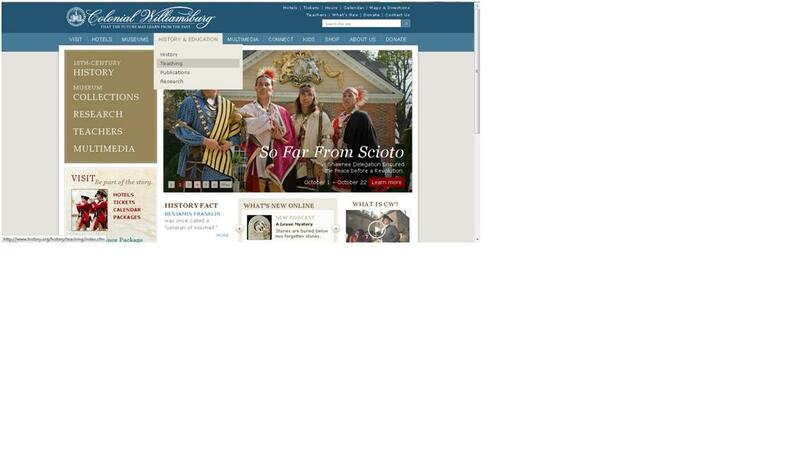 The Colonial Williamsburg website as a whole offers a plethora of resources for Social Studies teachers. I will focus specifically on the Teacher Resources section of the website, which is particularly useful for teaching American History and Government. After providing tips for navigating the site, I will evaluate four lesson plans available for teachers from this resource. I will further investigate the affordances and constraints of Colonial Williamsburg Teacher Resources, and provide some considerations for teachers interested in using this resource in their classroom. Teacher Resources: The Colonial Williamsburg Official Site offers helpful tools for American History and Government teachers. Under the Education heading, teachers can browse the site for lesson plans, video clips from the Electronic Field Trip series, browse for information about school group visits, check out special products and programs, and learn about upcoming events in Colonial Williamsburg. Not only does this site include tools to help teachers facilitate learning among students, but it also focuses on teacher development through the Teachers Institute; this enrichment program serves to promote citizenship education. The various subheadings on the Teacher Resources webpage serve many educational purposes. This site offers a variety of methods that are helpful for teachers in different circumstances. · Electronic Field Trips are available in classrooms across the United States through interactive broadcasts; this resource engages students in history by bringing it to life in their own class. · Teachers in the Williamsburg area can bring their students to Colonial Williamsburg on a school tour, information about which is available on the Teacher Resources site. · Also, special products, including CDs, DVDs, books, and the Teaching Resource guidebook, are available on this site for purchase to enhance Social Studies teachers’ lessons. · A variety of complete lesson plans that cover various topics in American History and Government are available on the Teachers Resources webpage, and serve as an extremely useful tool to help teachers implement new and unique ideas into their lessons. · Teachers can sign up to receive Colonial Williamsburg’s e-newsletter, which provides news and unique content information for Social Studies teachers, such as the primary source of the month. · In addition, Teacher Resources includes “The Idea of America,” a program that promotes citizenship education and critical thinking skills by engaging students in debates about controversial topics in Social Studies. Access to other resources follows a similar pattern. Click on any of the links (red) below the Education heading (blue). Some of these links will have more subheadings, such as the Lesson Plans link under the Teacher Community heading; explore the links that spark your interest. 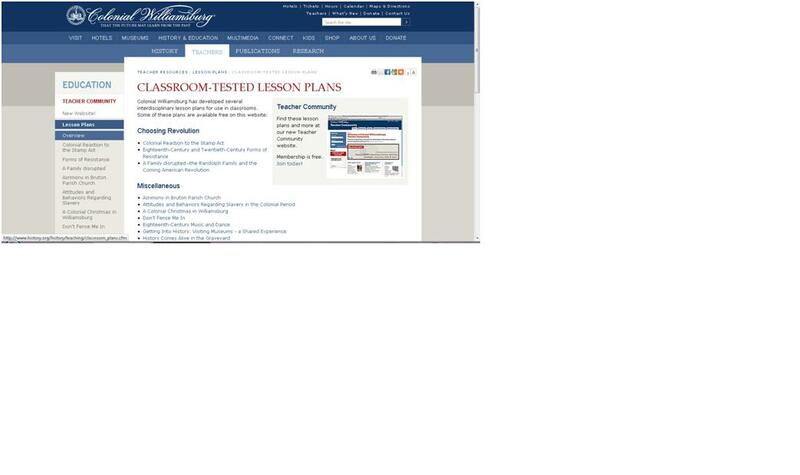 The following are examples of lesson plans offered by the Teacher Resources website. Although there are more lesson plans available on the site, I chose to sample four. These samples include a brief explanation and analysis of the lesson plan. This lesson plan begins with an introduction to resistance and what that term meant to different people throughout history. The lesson plan engages students in higher order thinking as students are asked to compare different forms of resistance over different periods in time. Students are engaged through listening to an original song and investigating two primary documents that reveal Colonial attitudes about resistance. Students use the Virginia Timeline http://www.history.org/history/teaching/tchcrtme.cfm) to gather an understanding of how resistance changed over time, and what it looked like in the Colonies. The lesson plan calls upon students to think of examples of twentieth-century resistance on their own, engaging in a discussion about how these forms are different than what happened in the Colonies. This lesson plan serves as a good resource for teachers, although more specific information about implementing the plan would be helpful. Also, a written assessment could provide teachers with feedback about the students’ understanding of the lesson, and could also help students as a study guide for their unit test. This lesson plan begins with an introduction to the Stamp Act, and explains the purpose of the lesson- for students to interpret primary documents to determine colonial reactions to the Stamp Act. This lesson also incorporates a colonial song along with the primary documents; the songs not only provide a method to inform students in a manner that they might not expect, but it can also grab the attention of students particularly interested in music. The lesson also includes group work, and calls for students to analyze documents together, with questions provided by the teacher to guide them along. Lastly, students engage in a debate about the Stamp Act, which is presented by the teacher as a controversial issue. This approach deepens students’ understanding of the issue and calls upon them to take a stance and defend their stance about a controversial topic. This lesson plan promotes citizenship education and critical thinking skills. Although discussion in Social Studies classrooms is very important, writing is important, as well. Adding a writing portion, perhaps as an assessment, to this lesson plan could help foster student learning in another form. This lesson plan begins with a brief introduction about music and dance, with a focus on its role in education for young people. This introduction includes information not only about gentry, but also how indentured servants and slaves participated in music, too. Providing multiple perspectives is important in a Social Studies classroom, especially in early American history which is all too often presented exclusively from the perspective of White males. The lesson begins with activity, more appropriate for elementary or early middle school, where the teacher asks students to show off some of their dance moves. Next, students read the excerpts from the primary documents about dancing in the Colonies (http://www.history.org/history/teaching/speakdan.cfm), and discuss their interpretations of the documents with a partner. The lesson plan provides music and information about dance steps so that the teacher can teach students a colonial dance, La Royale (http://www.history.org/history/teaching/laroyale.cfm). In addition to or instead of the dance lesson extension activity, this lesson plan suggests that secondary teachers create a graphic organizer where students discuss the role of dance throughout the past, present, and future. The assessment at the end of the lesson suggests that students create a collage about dance, although for secondary students they could write a paper about how the role of dance has changed over time in addition to their collage; students are thus still offered the opportunity to express themselves creatively. This lesson plan begins with an introduction about the difficult decision many colonists had to make as relations with Britain worsened: remain loyal to Britain or become a patriot? Through analyzing primary documents and biographical information, students investigate how this issue related to the Randolph family in Williamsburg. Students use biographical material from members of the Randolph family as well as their slaves to interpret their opinions about the coming Revolution. The fact that this lesson includes biographical material from slaves is an effective way to offer additional perspectives to this topic. After breaking into groups to discuss each biographical source, students share which side their assigned person favored, and how that decision affected people who were close to them. The lesson suggests that teachers make a list on the board or projector for each person that explains why they made their decision. After this step, however, I would suggest working on students writing skills by instructing them to write a paragraph or two that compares the decision of their assigned person to that of another member of the family or slave who was affected in a different way. 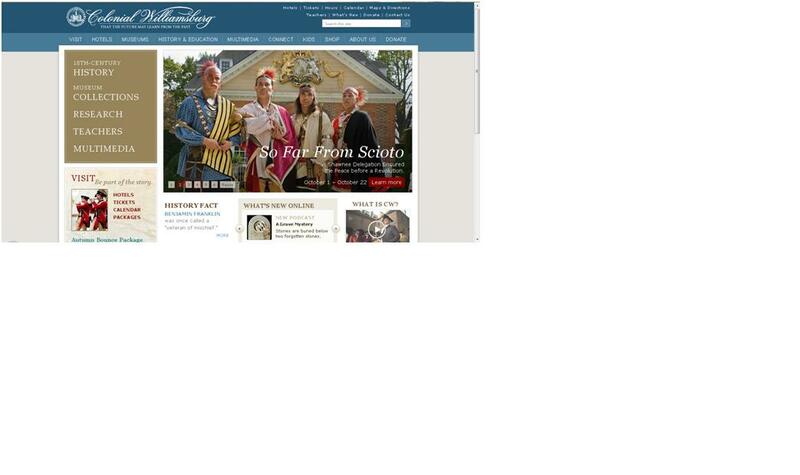 Teacher Resources: The Colonial Williamsburg Official Site offers many helpful tools for Social Studies teachers. Information available from the site covers a variety of topics, which means teachers can use it for a broad scope of lessons. Teacher Resources provides multiple methods to engage students in learning about Social Studies through a field that they are familiar with: technology. This resource helps teachers to facilitate learning in a way that appeals to the technology that students are accustomed to using on a daily basis, such as television, video games, or websites. Teacher Resources is also a refreshing way to present content to students in a manner other than lecturing or using PowerPoint. “The Idea of America” page on the Teacher Resources site is another very positive aspect of this educational tool; although teachers must purchase the series. “The Idea of America” not only instructs students about citizenship, a key topic in any Social Studies classroom, but it also engages students in critical thinking. This tool presents students with information about controversial topics that relate to all Americans, such as unity vs. diversity, and includes guides for teachers to facilitate student discussions about these important topics. A discussion about unity vs. diversity, for example, could be conducted in an American History classroom. This topic runs throughout American History even through the present time; therefore the teacher could remind students about the ideas that they expressed in the initial debate, and perhaps continue the discussion on a smaller scale after several units. Despite all of its positive qualities, there are some constraints to using Teacher Resources: The Colonial Williamsburg Official Site. When teachers use technology in the classroom they must always leave room for technical difficulties. Teachers should plan ahead to make sure that their school’s wireless internet is functioning properly if they want to use the website in their classroom. Also, this site includes clips of information about many Colonial Williamsburg resources available for teachers, yet some of these items must be purchased by the teacher or school. Consequently, teachers must plan ahead in order to make sure that they have all of their materials when they plan to teach a given lesson. Make sure that you have a thorough understanding of the lesson plans before you use them in your classroom; several of these plans call for online materials, so make sure that you can connect to your school’s wireless internet, or that you print out the sources ahead of time. Adapt lesson plans to suit your classroom. Some of the lesson plans are geared toward younger students, but can be adapted to suit high school classes, and vice versa. For example, consider adding a writing component for secondary students or adding images as primary sources for elementary students. If the lesson plan includes group work, consider constructing these groups before the students get to class in order to save valuable instruction time. Create assessments that match your objectives for using various aspects of the site. In addition to the Teacher Resources page, explore other aspects of the Colonial Williamsburg Official Site, which offers other resources that, although not specifically geared towards classroom education, are great tools to enhance an American History lesson. Examples of which include, but are not limited to: video clips, slideshows, podcasts, audio, and online games.